Mason Jar Lotion/Soap Dispenser Converter Lid Wide Mouth - (3.5" in diameter) Convert any wide mouth canning jar and add some elegance with this with this high quality lotion or soap dispenser converter. This one piece lid comes with a 2 piece pump system and tube. This converter fits Wide Mouth size mason or smooth-sided jars. Black & white pumps have 6-5/8" dip tube and gold pumps have 5 1/4" long dip tube. Just unlock the pump and cut the tube to fit your jar. 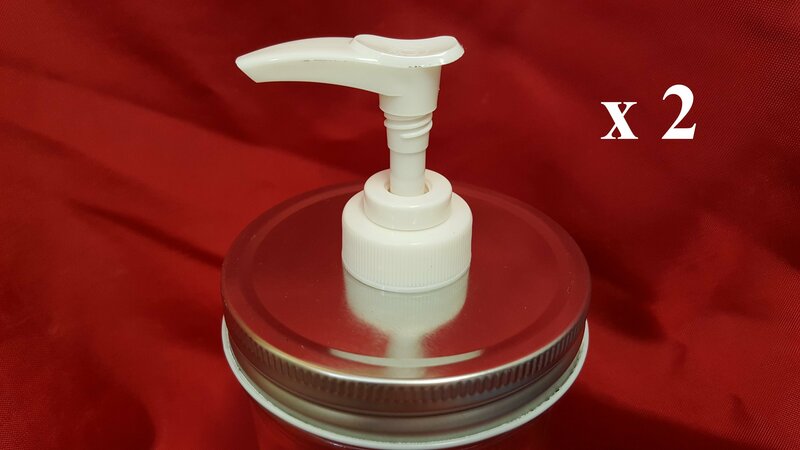 Choose from singles to match your kitchen, bath, mud room, garage or camper or get a 2 or 3 pack They come in Gold, White or Silver You will receive the lid and 2 piece pump that you can cut to fit your jar. Note - DO NOT fill jar up to top so it touches the lids. These lids need to stay dry. They are made with the finishes listed. ***Jars pictured are for display purposes only - they are not included. *** If you are intersted in regular size converters, please see our other listing.